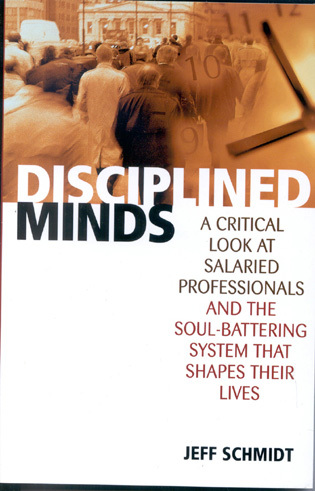 Disciplined Minds is a witty, incisive, original analysis of the politics of professionalism—especially with respect to those fields in which 'professional training' involves an education in how to become oblivious to the political role of one's profession. A blistering critique of how knowledge workers have been subordinated in America. Finally, a book that tells it like it is. I have been waiting a long time for someone to write this book, and Jeff Schmidt has done it. He exposes, in crystal-clear prose, the inevitably political nature of the professional in our society, and, most importantly, suggests a strategy for resistance. This is an extraordinary and valuable piece of writing. Schmidt has hit the bull's-eye. Schmidt analyzes the true meaning of being a professional and the sacrifices that professionals make to achieve their career goals. He challenges them to think outside the box, use their intuition and their attitude to provide for a better society. There is much that is thought provoking and illuminating in Disciplined Minds. This book should be read by anyone thinking about embarking on a professional education in any field, as well as by those who wonder why their dream job doesn't seem so dreamy after all. — Politics and Prose Bookstore, Washington, D.C. 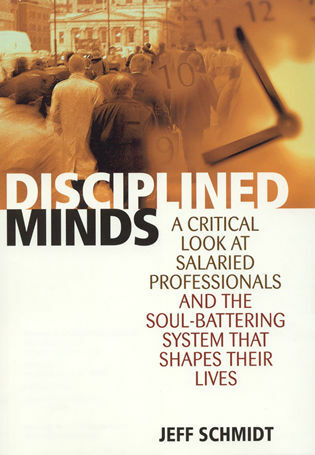 Disciplined Minds is a radical, disturbing, and provocative look at professional life. 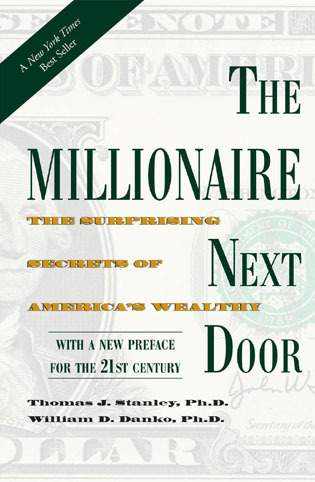 It offers a profound analysis of the personal struggles for identity and meaning in the lives of today's 21 million professionals. The book will shake up the readers. Just after publication of this book Disciplined Minds, Jeff Schmidt was fired after 19 years as a staff writer for Physics Today magazine. In his book Schmidt argues that a hierarchical organization's structure almost guarantees that its workers cannot devote their full energy to the job; he was terminated after a supervisor learned that in his foreword to the book, he playfully wrote that he had completed it partly on 'stolen time'. Schmidt is a very good writer, and particularly skilled at constructing his case through example and anecdote. His thesis is compelling. In this book Jeff Schmidt gives us a remarkably insightful political analysis of the process of inculcating graduate school initiates into a discipline, and how this process of 'disciplining' contributes to the making and perpetuating of unfree minds in the professions. Schmidt offers a provocative critique of how scientists, engineers, and other professionals are groomed to fulfill a specific function in society—that of maintaining the status quo—and, in the process, end up sidelining their own goals and ideals. 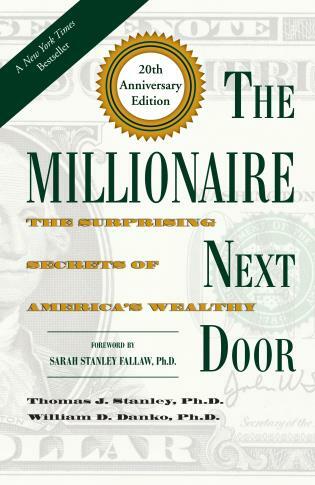 The book is both well-researched and highly readable. Some readers may disagree with its conclusions, but everyone will recognize its descriptions of the often wrenching choices that today's professionals must make. I found Disciplined Minds while planning a course that will deal with the social role and moral responsibility of intellectuals, and after I finished reading it I whooped with joy. It is the perfect book to engage students on these issues — well researched, powerfully argued, and clearly written. Even conservative students with politics at odds with Schmidt's find the book valuable because of its (sometimes painful) honesty and clarity. 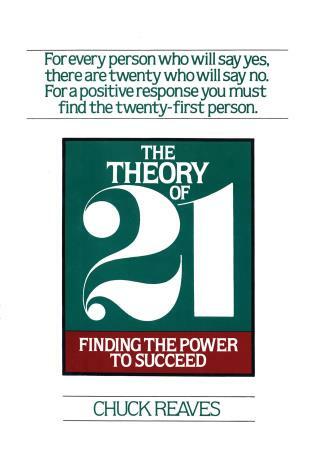 In addition to using it in my course, I wish I could make Disciplined Minds required reading for my faculty colleagues. This book comes from the heart...a rallying cry to dissatisfied professionals and disillusioned students to organize and reshape the system that is stifling them. Disciplined Minds is a freewheeling, thought-provoking examination of the way ideological control is exercised over an increasingly important section of the working class- the professionals.